My story begins in a small country town. A town with no traffic lights, one main street through the middle, a line of shops, and where everyone knew everyone and would stop to have a chat... My parents and their families were well known and respected in the town. My mother was a high school teacher and my father a plumber. My parents had two beautiful boys. One dark haired and the other a blonde. Both though different in personalities, were a joy. Then a surprise - another pregnancy. Preparations, excitement...would it be a boy or a girl? There were no scans or other types of tests in the 1960s so as far as anyone knew this pregnancy was going to produce another perfect baby...just like my two brothers. Oh how wrong they were. How shocked was everyone going to be when I appeared in the world? I was two weeks overdue and my mother was induced. Dad was at work - fathers weren't involved in the birthing process in the '60s. Lots of babies have to be induced so nothing untoward there. It was a hard labour for my mother though again nothing unusual. I arrived whilst the obstretician was performing a caesearan on another patient so I was delivered by a mid-wife. Mum saw me briefly and I was whisked away. No one came near Mum and she didn't know what was going on. She was confused. What was wrong with her baby? The next indicator to Mum that there was a major problem with me was when she next overheard the nurse on the phone. She had rung Dad and told him to come to the hospital straight away as there was a problem with the baby. When Dad arrived they were told together that I had some type of craniofacial deformity. Now this was not a missing arm, or deafness or even hip dysplasia. This was in your face...my face...a small skull, bulgy eyes, large lower jaw. Not normal. Very hard to hide or pretend nothing is wrong. I feel for Mum and Dad. There were no social workers, no counsellors, no support groups or social media. They faced 'my face' alone. Just with numbness and shock as their friend. I can only imagine the devastation and the anger and the questions - what went wrong? Why did this happen? That afternoon my Nana came to the hospital to see me. She told Mum that I was beautiful. Through tears Mum said that no I didn't look beautiful. My mum's world had fallen apart and she was full of a mixture of emotions, from fear to guilt. But through all these mixed emotions there was no thought of giving me up for adoption for allowing me to die by starvation. I had reflux and was kept in the hospital for 2 weeks until I was feeding properly. Mum came down with a cold sore from all the stress and was not allowed to go near me, so she went home and left me at the hospital until it was time for me to go home. 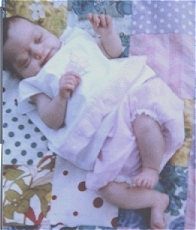 I was kept in the nursery with the babies who were up for adoption only having contact with the nurses and the doctor. This was my introduction to life.